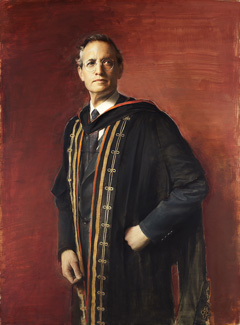 Harold Tafler Shapiro, an alumnus of Princeton’s Graduate School, came to Princeton from the University of Michigan, where he had been president for eight years. A native of Montreal, with dual American and Canadian citizenship, Shapiro received his bachelor’s degree from McGill University in 1956. As a student of McGill’s Faculty of Commerce, he won its highest academic honor, the Lieutenant Governor’s Medal. He spent five years in business before enrolling in Princeton’s Graduate School in 1961. He received a doctorate in economics from Princeton in 1964. Shapiro then joined the faculty of the University of Michigan. He was named vice president for academic affairs in 1977 and elected president in 1980. Shapiro returned to Princeton as its president in 1988. Under his leadership, Princeton celebrated its 250th anniversary, expanded its motto (at his initiative) from “Princeton in the Nation’s Service” to “Princeton in the Nation’s Service and in the Service of All Nations,” and completed the most successful fundraising campaign in its history, raising $1.14 billion. During his tenure, the University’s endowment quadrupled from approximately $2 billion to more than $8 billion. Shapiro oversaw successful efforts to increase both the overall quality and the diversity of Princeton’s undergraduate and graduate student bodies, including substantial improvements in the University’s undergraduate student aid programs to more effectively meet the needs of both lower- and middle-income families. During Shapiro’s presidency, the percentage of international students in the undergraduate student body nearly doubled (to 10 percent), and there also were significant increases in graduate fellowship support. Shapiro implemented several undergraduate teaching initiatives, including creating a special fund to support innovation, developing a program to bring exceptional teachers to Princeton as visiting faculty, providing awards for teaching excellence that are presented each year at Commencement, and establishing a Center for Teaching and Learning. He oversaw a significant expansion of Princeton’s freshman seminar program and of opportunities for students to study abroad. Shapiro presided over a period of steady growth in the size and distinction of the faculty, and the development of new academic programs such as an Institute in Integrative Genomics; an interdisciplinary Center for the Study of Religion; the Society of Fellows in the Liberal Arts (anchored by the Cotsen Fellows in the Humanities); the University Center for Human Values; new master’s programs in finance, engineering, and public policy; and new initiatives in alumni education. Shapiro initiated the most substantial program of building renovation (especially dormitory renovation) in Princeton’s history, while overseeing the construction of important new buildings such as the Frist Campus Center and planning for a sixth residential college to accommodate a 10 percent increase in the size of the undergraduate student body. As a national leader, Shapiro served two U.S. presidents: George H.W. Bush (as a member and vice chair of the President’s Council of Advisors on Science and Technology) and Bill Clinton (as chair of the National Bioethics Advisory Commission). While he was president, Shapiro continued to teach courses in the history of American higher education and in bioethics. After retiring from the presidency, he returned to full-time teaching and research in the Department of Economics and the Woodrow Wilson School of Public and International Affairs. Harold T. Shapiro (b. 1935).